Did you know that Sheffield Students’ Union plans to be Zero Waste? It’s the launch of the University’s Sustainability Strategy this week and the campus is buzzing with ideas about how we can be more sustainable. Grantham Scholar Gloria Mensah has been adding to the green revolution through her work with Sheffield Students’ Union. Here you can read about how she helped them tackle their waste. After months of being engrossed in the politics of Carbon Capture Utilisation and Storage technologies (my current research), I decided to take advantage of a placement at the Sheffield Students’ Union (SU) and channel my energy into something quite different. After all, being given these opportunities is what being a Grantham Scholar is all about! So, between May and August 2018, I took on a role as Project Assistant on the ‘Zero waste’ project at the Sheffield Students’ Union (SSU). In this blog, I will share the activities I engaged in and some of my most memorable experiences. Waste and recycling is one of the core components of any organisation’s strategy to meet sustainability objectives. 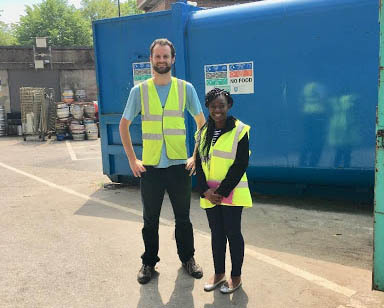 Universities and their corresponding student union organisations have a role to play in ensuring that the waste they generate does not lead to negative environmental impacts. Universities are already doing a lot in this regard, however there is still more to be done as they place themselves on a path to achieving zero waste. Universities have a legal obligation to ensure that the waste they generate is disposed of in a responsible manner and that their processes meet a set of UK National and European legislation. One of the key features of UK Waste Management policy is the principle of the ‘Waste Hierarchy’ – 5 steps for handling waste ranked according to the environmental impact of the various options – ‘Reduce, Reuse, Recycle, Recover, Dispose’. As part of measures to meet sustainability objectives, the SU has set itself a vision to retroactively implement zero waste in all its outlets as well as ensuring that all new outlets are zero waste by design by 2034! As a first step to drive this vision, my role was to analyse the SU’s current policy and performance on waste, recycling, purchasing and outlet development, in order to discover current baselines. I was also to research sector-based practices in order to create an action plan to aid the SU to reduce its overall waste generation and meet its 16-year ambition. You may ask what going ‘zero waste’ means for the SU or wonder whether the concept signifies ‘no waste’ generation at all. There is no industry standard definition for ‘zero waste’; zero waste could mean different things for different organisations. However, Zero Waste International Alliance (ZWIA) provides a working definition for zero waste to guide businesses and organisations in their own definitions. ZWIA defines Zero Waste as “a goal that is ethical, economical, efficient and visionary, to guide people in changing their lifestyles and practices to emulate sustainable natural cycles, where all discarded materials are designed to become resources for others to use”. This implies in order to achieve zero waste, all efforts to prevent waste generation in the first place should be the primary goal. Additionally, products should be re-designed to incorporate greater resource efficiency, people should be encouraged to re-use items while recycling rates should be increased. To assess the SU’s current waste performance, we employed a variety of methods, including conducting a simple walk-through exercise in the SU to assess the current waste management system in place, conducting a waste yard inspection, analysing waste figures, deliberating on the zero waste vision with commercial managers of the various outlets in the SU, collating information using questionnaires from catering managers, and conducting informal interviews with key personnel. The walk-through exercise provided insights into waste categorisation, the types of materials ending up in the waste bins, levels of contamination of waste bins, student and staff practices and general challenges of waste management. By analysing waste data, we were also able to observe trends in waste generation and calculate recycling rates to set the baselines and identify opportunities for waste reduction and recycling. Our investigations show that the SU aims for continuous improvement in its environmental actions, especially on the subject of reducing waste. Many environmental initiatives have been embarked upon in the last year and are still on-going, yielding positive results. 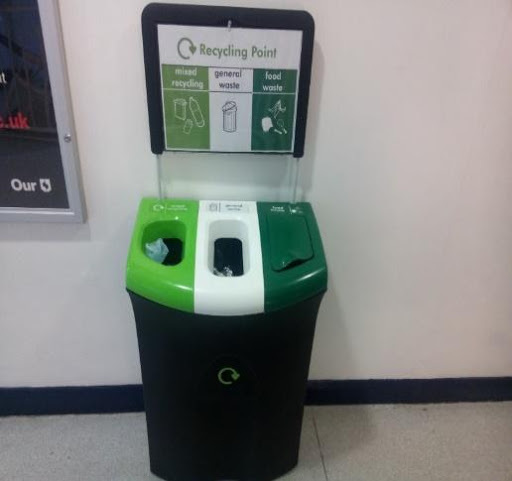 These include the opening of the zero waste shop, launch of the reusable revolution (discounts on reusable cups and tupperware in SU outlets), purchase of new bins for categorising waste under general waste, mixed recyclables and food waste only, community fridges in residences, amongst others. Having completed the audit, I was asked to find a definition of ‘zero waste’ for the SU. So now, for the SU ‘Zero waste is a goal to recycle at least 80% of overall waste generation and compost the remaining 20% by 2034, with the only allowance for incineration made for hazardous waste, which will therefore be excluded from these totals’. What next for the SU on Zero waste? The audit also provided a means to identify some of the main challenges currently being faced at the SU for which the action plan was developed. Some of the challenges identified included contamination in recycling streams which suggested a ‘sorting waste’ problem, insufficient waste data collection, problems with monitoring and reporting, inadequate waste handling and recycling, and insufficient training/communication. Included in the action plan were a set of recommendations to tackle these concerns – such as strategies to reduce upstream and downstream waste generation, to increase recycling, adding options for composting, strategies to reduce food waste (e.g. introducing some flexibility on menus and prices to avoid food wastage). We also developed strategies to ensure that the supply chain and procurement process is more sustainable and strategies to inspire people towards a positive environmental culture, through various communication media to keep the zero waste vision continually in sight and re-shape values. Working as a Project Assistant on the ‘Zero waste’ project provided me with a wealth of experience. I really enjoyed working with a diverse team, this enhanced my team working skills and ability to build strong working relationships. Moreover, bringing in knowledge from previous work experience into the project was an opportunity to revisit and sharpen my skills. I look forward to seeing the recommendations being put into action! The next time you think about creating waste, remember the harm you’re causing to the planet. “A recent study reveals that 8.5 billion plastics are thrown away each year in the UK. There are over 150 million tonnes of plastic in the world’s oceans and every year one million birds and over 100,000 sea mammals die from eating and getting tangled in plastic waste”.